These moist chocolate cupcakes with rich fudge frosting have a delicious surprise — a minty cream filled center! Cupcakes aren’t just for kids! This rich chocolate cupcake has a fudge frosting and a Creme De Menthe filling, a.k.a. Minty Cream Filled Cupcakes! 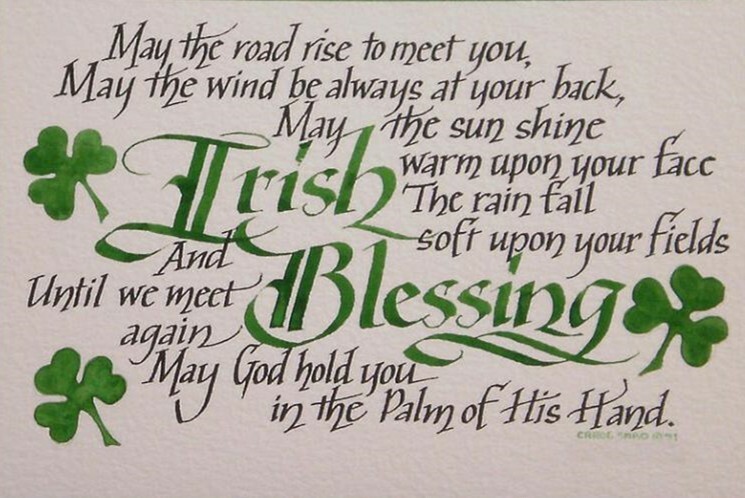 Perfect for your St. Patrick’s Day celebrations! I’ve wanted to try making cream filled cupcakes for a while now, and St. Patrick’s Day just seemed like the right time to give ’em a try. 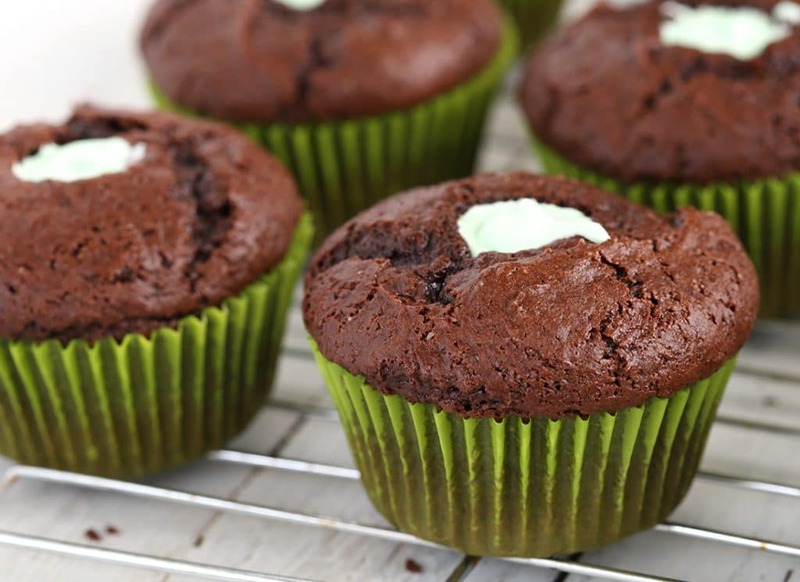 I decided to make a chocolate cupcake with a mint-flavored cream filling, thinking these cupcakes would be festive and pretty for a St. Patty’s party. Some recipes I researched gave directions for using a small knife to cut the middle out of the cupcakes for the filling, but I found a really cool kitchen hack—use a citrus tap! Gently twist the citrus tap into the center of the cupcake and lift to remove the center. Push the cake out of the tap with your finger and go again. Coring the cupcakes is quick, easy, and practically no mess. I’ll definitely be making cream filled cupcakes often with this little trick! The cream filling settles a little after piping, so before starting on the frosting top each of them off with a bit more if the filling has sinked in more. At this stage, pop the cupcakes into the refrigerator to chill while making the frosting so that the filling will set up a bit. This will allow you to dip the cupcakes into the frosting instead of spreading with a spatula. The frosting will be a little thick, so you will want to microwave it for a few seconds to melt it to dipping consistency. This method gives the cupcakes a smooth ganache-like top. Add a few sprinkles while the frosting is still wet and then store in the refrigerator. In a large mixing bowl, add cake mix, oil, buttermilk, eggs, and dry pudding mix. Beat until fully combined on medium speed. Line 2 muffin pans with 18 paper liners. Fill each muffin liner 3/4 full with batter. Bake 15-18 minutes or until a toothpick inserted in center is removed clean. Cool cupcakes completely on a wire rack. Use a small knife or citrus cap (see post for tip) and remove cores from cupcakes. Beat butter until creamy. Add powdered sugar and Creme De Menthe and mix until smooth. Add marshmallow fluff and mix until just combined. Place filling in a pastry bag with a large tip or in a large ziplock bag (cutting off the tip of a bottom corner). Pipe filling into each hole and fill to the top. Refrigerate cupcakes while making the frosting. Beat butter, cocoa and vanilla until creamy. Add powdered sugar and milk and mix until smooth and creamy. Place frosting into a microwave safe bowl and microwave frosting 15-20 seconds. Stir until smooth. Dip each cupcake into frosting. Decorate with sprinkles, if desired. Store in refrigerator. Recipe adapted from Wonky Wonderful. I need these in my life this weekend! Love the filling! Mmmm mint cupcakes! What a gorgeous flavor for a cupcake! And I love that element of green you’ve added there, these would be perfect for St. Patrick’s day maybe? Cupcakes are so much more fun when they have a surprise inside! Yummy! Cupcakes with a surprise in the middle are the best, and I love that these one have a boozy twist! Cool tip on the citrus tap! These cupcakes look so good — love the filling! Oh man, I love chocolate and mint together! This looks so good!